we are always looking for new breakfast ideas for weekend mornings. 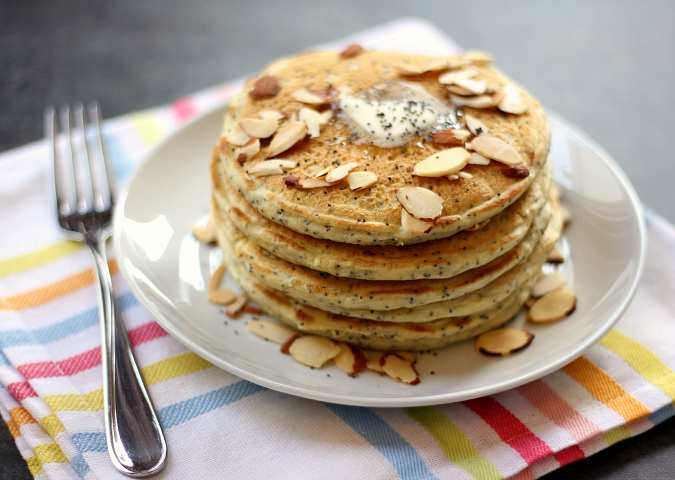 we made these almond poppy seed pancakes for breakfast on sunday morning this past weekend, and they were so wonderful. the almond extract gives these pancakes an awesome flavor, and the poppy seeds give them a great texture. 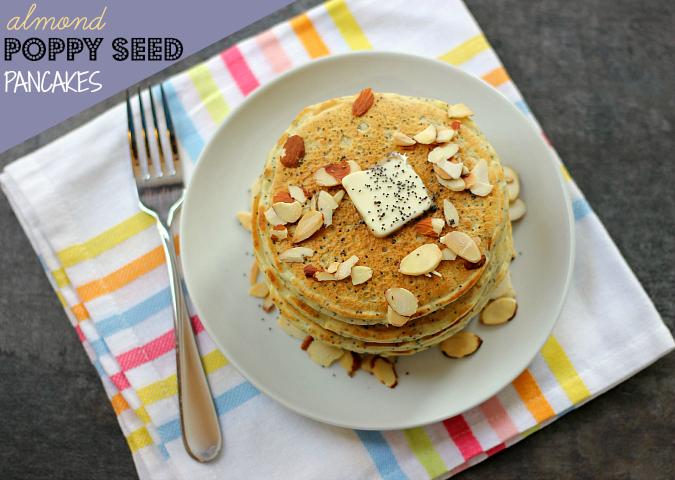 we garnished the pancakes with toasted sliced almonds and a sprinkle of some additional poppy seeds. we served them hot off the griddle with warm maple syrup. such a delicious way to start a sunday! in a large bowl, whisk together the flour, baking powder, baking soda, sugar, and poppy seeds. in a separate bowl, whisk together the buttermilk, milk, egg, almond extract, and vanilla extract. pour the milk mixture into the flour mixture and whisk just until combined. heat a lightly buttered griddle or frying pan on medium heat. pour 1/4 cup of batter onto the griddle for each pancake. cook for 4 minutes, until small bubbles begin to form. flip the pancakes when they start to bubble, then cook for 3-4 minutes, until they are golden brown and cooked throughout. once cooked, transfer the pancakes to a baking sheet and place in a preheated 200 degree F oven to keep warm while you cook the remaining pancake batter. serve warm with toasted sliced almonds and warm maple syrup. Delicious! Love the addition of poppy seeds and sliced almonds on top.